Definition at line 24 of file test000087.h. Definition at line 49 of file test000087.cpp. 51 // Create the root container. 53 // Create the global data model. Definition at line 57 of file test000087.cpp. Definition at line 165 of file test000087.cpp. References CCopasiDataModel::exportSBMLToString(), CCopasiDataModel::getCurrentSBMLDocument(), CCopasiDataModel::getModel(), load_cps_model_from_stream(), MODEL_STRING4, pCOPASIDATAMODEL, and CCopasiMessage::size(). Definition at line 220 of file test000087.cpp. References CCopasiMessage::EXCEPTION, CCopasiDataModel::exportSBMLToString(), CCopasiDataModel::getCurrentSBMLDocument(), CCopasiMessage::getLastMessage(), CCopasiDataModel::getModel(), load_cps_model_from_stream(), MODEL_STRING4, pCOPASIDATAMODEL, CCopasiMessage::RAW, and CCopasiMessage::size(). Definition at line 62 of file test000087.cpp. References CCopasiMessage::getLastMessage(), CCopasiMessage::getNumber(), CCopasiDataModel::importSBMLFromString(), MCSBML, MODEL_STRING1, pCOPASIDATAMODEL, and CCopasiMessage::size(). Definition at line 94 of file test000087.cpp. 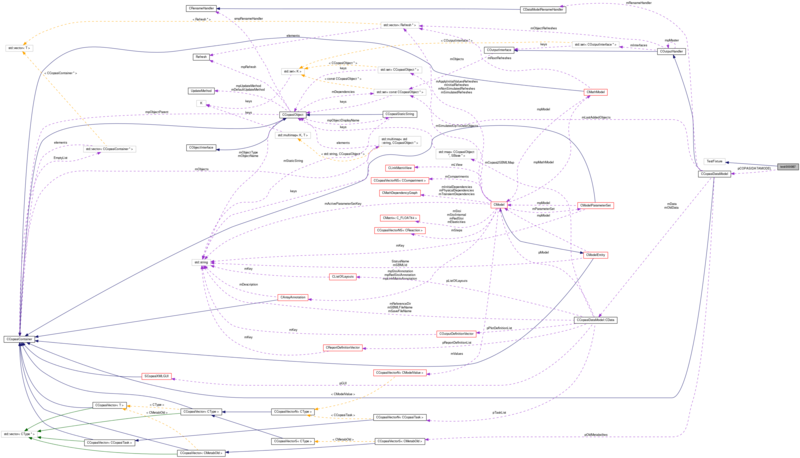 References CModelEntity::ASSIGNMENT, CModel::getCompartments(), CModelEntity::getExpressionPtr(), CModel::getMetabolites(), CCopasiDataModel::getModel(), CModel::getModelValues(), CEvaluationNodeObject::getObjectCN(), CCopasiObject::getObjectName(), CCopasiObject::getObjectParent(), CModel::getReactions(), CModelEntity::getStatus(), CEvaluationNode::getType(), CCopasiDataModel::importSBMLFromString(), CCopasiObject::isReference(), MODEL_STRING2, CEvaluationNode::OBJECT, CCopasiDataModel::ObjectFromName(), pCOPASIDATAMODEL, CCopasiVector< T >::size(), and CEvaluationNode::type(). Definition at line 133 of file test000087.cpp. References CCopasiMessage::getLastMessage(), CCopasiMessage::getNumber(), CCopasiDataModel::importSBMLFromString(), MCSBML, MODEL_STRING3, pCOPASIDATAMODEL, and CCopasiMessage::size(). Definition at line 274 of file test000087.cpp. References CCopasiVectorN< CType >::add(), CModelEntity::ASSIGNMENT, C_FLOAT64, C_INT32, CReportDefinitionVector::createReportDefinition(), CModelEntity::FIXED, CKeyFactory::get(), CReportDefinition::getBodyAddr(), CCopasiObject::getCN(), CModel::getCompartments(), CModelEntity::getExpressionPtr(), CReportDefinition::getHeaderAddr(), CMetab::getInitialConcentration(), CModelEntity::getInitialValue(), CModelEntity::getKey(), CCopasiRootContainer::getKeyFactory(), CModel::getMetabolites(), CCopasiTask::getMethod(), CCopasiDataModel::getModel(), CModel::getModelValues(), CEvaluationNodeObject::getObjectCN(), CCopasiObject::getObjectName(), CCopasiObject::getObjectParent(), CCopasiParameterGroup::getParameter(), CCopasiTask::getProblem(), CModel::getReactions(), CCopasiTask::getReport(), CCopasiDataModel::getReportDefinitionList(), CEvaluationTree::getRoot(), CReportDefinition::getSeparator(), CCopasiDataModel::getTaskList(), CEvaluationNode::getType(), CCopasiDataModel::importSBMLFromString(), CTrajectoryTask::initialize(), CCopasiObject::isReference(), CCopasiMethod::LSODAR, CEvaluationTree::MassAction, max, MODEL_STRING5, CEvaluationNode::OBJECT, CCopasiDataModel::ObjectFromName(), CCopasiTask::OUTPUT_UI, pCOPASIDATAMODEL, CTrajectoryTask::process(), CCopasiVectorN< CType >::remove(), CTrajectoryTask::restore(), CTrajectoryProblem::setDuration(), CModel::setInitialTime(), CReportDefinition::setIsTable(), CTrajectoryTask::setMethodType(), CCopasiProblem::setModel(), CReport::setReportDefinition(), CCopasiTask::setScheduled(), CReportDefinition::setSeparator(), CTrajectoryProblem::setStepNumber(), CReport::setTarget(), CReportDefinition::setTaskType(), CTrajectoryProblem::setTimeSeriesRequested(), CCopasiParameter::setValue(), CCopasiVector< T >::size(), strToDouble(), CCopasiTask::timeCourse, and CEvaluationNode::type(). 349 // is the same as the flux through the reaction. Definition at line 39 of file test000087.h. Definition at line 40 of file test000087.h. Definition at line 41 of file test000087.h. Definition at line 42 of file test000087.h. Referenced by test_export_reaction_flux_reference_1(), and test_export_reaction_flux_reference_2(). Definition at line 43 of file test000087.h. Definition at line 38 of file test000087.h. Referenced by setUp(), test_export_reaction_flux_reference_1(), test_export_reaction_flux_reference_2(), test_import_reaction_flux_reference_1(), test_import_reaction_flux_reference_2(), test_import_reaction_flux_reference_3(), and test_simulate_reaction_flux_reference_1().